I am so proud of the BBC News Africa for sharing positive news from Africa and helping to spread awareness of the good sides of Yoruba culture. Last month, I wrote about the Rain Maker from Nigeria. Today’s blog post is about Ara Thunder, a female talking drummer from Nigeria. "What a man can do, a woman can do better"
Ara Thunder is one of few women in Nigeria who play the traditional "talking drum" – an instrument long used to send messages between villages. ARA THUNDER, the talking drummer with a thunderous effect, plays the gangan (talking drum) with the efficacy of a goddess. 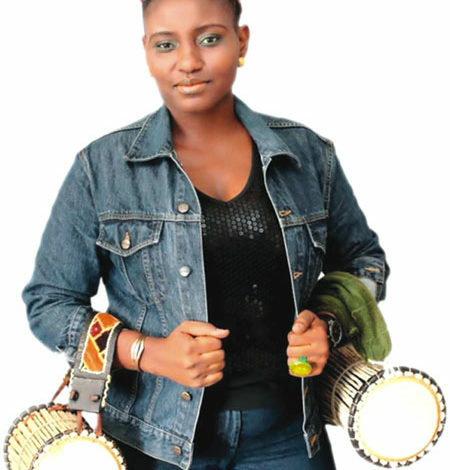 Ara, a young talent from the Eastern Nigeria has transformed herself to lightning on the talking drum, a male-dominated instrument of South West Nigeria. You can connect with Ara on Facebook and on Instagram. What I find most intriguing about Ara is that she is not Yoruba. It simply tells me that she was motivated and determined to learn about the Yoruba culture and master the skill of playing a talking drum. The take home from this is that you are only limited by your imagination! Writing this post reminded me of another post I wrote last year about talking drums. Whilst Ara uses the gangan, the blog post about talking drums I wrote last year was about the bata drums. Click here to read my post from last year about the bata drum. Gangan which is commonly referred to as Talking Drum holds a special place in the tradition of the Yoruba people, and its use in Yoruba folklore cannot be overemphasized. Its origin can be traced to the Old Oyo Empire in South-West, Nigeria. It was introduced as a means of communication during the inauguration of the Alaafin of Oyo. They are used to imitate different tone and chant patterns of the Yoruba language. Its hourglass shape makes it possible for it to be held under the arm. They are frequently used in modern churches, festivals, wedding ceremonies and carnivals. You can read more about gangan drums by clicking here. Bata is a double-headed drum shaped like an hourglass with one cone larger than the other. It’s used majorly in religious functions, festivals, carnivals and coronations. It’s also used to convey messages of hope, divination, praise and war. A set of batá consists of three drums of different sizes. The drums are similar in shape to an hourglass and each drum has two different sized heads and are played sitting down with the drum placed horizontally on the knees. This allows the drummer to play with both hands. It is of many types like Iyá (“Mother”) is the largest drum and leads the group. The Itótele, the middle-sized drum and the Okónkolo, the smallest of the three playing short. You can read more about Bata drums and other talking drums by clicking here. You can read up about other talking drums on NigerianBulletin.com. I started writing this post to highlight Ara Thunder as a female talking drummer in a male-dominated industry. However, in the course of getting further information as to what I would write, I found out about another female talking drummer who is Yoruba. As I believe in #NoWomanLeftBehind, I just have to mention this other female talking drummer. Her name is Oluwakemi Famugbode Adetula and you can read up about her and how she became a talking drummer by clicking here. I find Oluwakemi intriguing too, because she uses her talking drum to play Jazz. How amazing is that?! Have you heard of the Yoruba Bata drums? This entry was posted in Segilola's Corner and tagged talking drums, yoruba drums. Bookmark the permalink.